I also used scraps from my scrap bin on this card (sorry don't recall manufacturer) plus some ribbon and pearls from my stash! No new supplies used.....how's that for shopping my stash? I hope you will play along with us this week I'd love to see what oldies but goodies you have in your collection! Be sure to check out SOS to see the other creations by our talented design team. 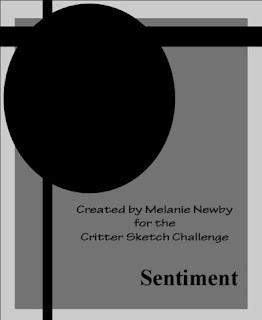 It's time for another challenge over at The Critter Sketch Challenge Blog #71 - and it's a sketch by our very own April Lower! The image is from our monthly sponsor Wags n' Whiskers and is called Magical Friends. I'm so in love with Vintage now!! Be sure to check out the other Sundae Girls creations over at Paper Sundaes and play along for your chance to win a fabulous prize from Tickled Pink Stamps! I'm so glad this week is finally over and it's the weekend!! Even though it was a short week for us here in Canada due to Victoria Day it felt extra long to me. I needed something bright and cheery to make me smile so I decided to make a card with this fabulous whimsical image from The Stamping Boutique called "Dilly-Dally". How can you not be happy when colouring a fun image like this one? The image was coloured with copics and then mounted on top of a nesties lacey squares die. I added a couple of brads and a sentiment I've had for ages and kept it simple. I LOVE this image!! You still have time to enter the Monthly Challenge over at The Stamping Boutique Challenge Blog for your chance to win some free TSB images!! Shopping Our Stash (SOS) Challenge #1 Ribbon Rewind!! 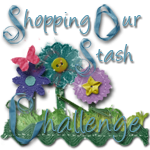 I'm super excited because today is the day that Shopping our Stash (SOS) Challenge Blog celebrates our first ever challenge!!! 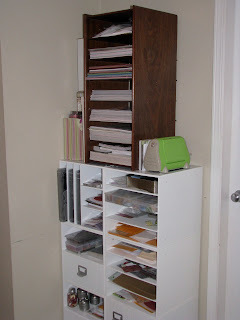 Now the whole idea behind our blog is to use items from your stash of supplies!! I LOVE this because it means I'm using stuff I already have rather than rushing out to buy more stuff that I don't really need. For Challenge #1 we are calling it Ribbon Rewind and we would like you to pull out your oldest ribbon, or use the colour of ribbon you have the most of or even show us a new technique that you wouldn't normally use for your ribbon. Sounds fun right? For my card I attempted to make a ribbon blossom from this SCS tutorial using some of my ribbon stash in pinks & browns (all old and colours I have the most of). I used 4 different ribbons for my flower! 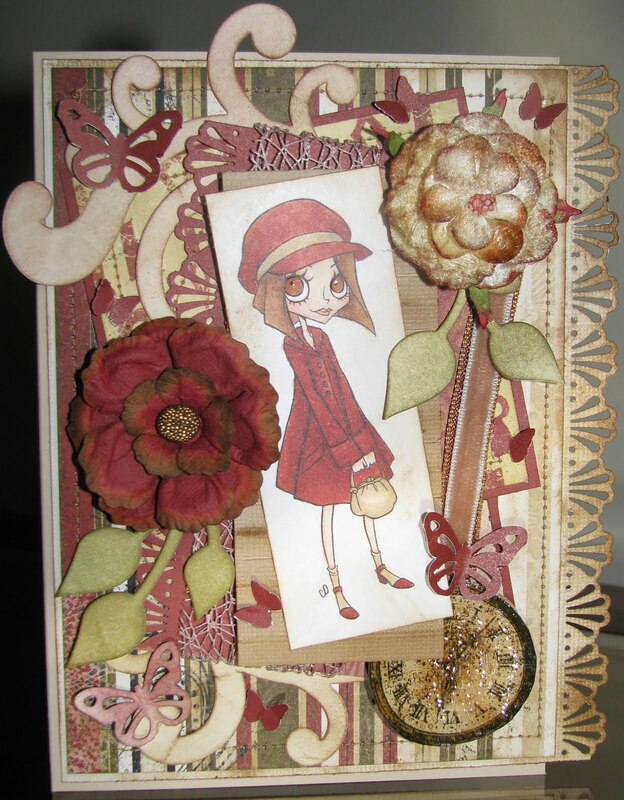 The paper I used for my card is by Bo Bunny and the large flower I added is by Prima. I coloured my Magnolia Birthday Tilda image with copics and then cut out using my nesties. Other supplies used: Fiskars Border punch, Magnolia Happy Birthday Sentiment. 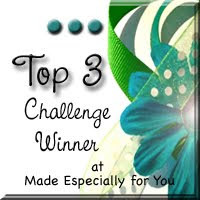 Be sure to check out the SOS Challenge Blog to see the other DT creations they are FABULOUS!! There are all kinds of different projects, not just cards!! There is also a fabulous link under our RESOURCES tab for you to get some ideas on how to use your ribbon. I hope you will play along with us this week and a big THANK YOU to all the participants in our Show Us Your Stash 2 week Open House Kick-off!! It was great to see your crafting spaces!! I coloured up this image by The Stamping Boutique called Picket Fence because it reminds me of Spring and brought a touch of spring into my day!! I love all the flowers and those little butterflies!! I kept everything fairly simple and just coloured this amazing digi with copics, added some ribbon & a Making Memories Ribbon charm I've had for a REALLY long time! 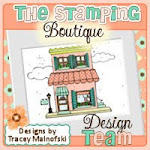 The Stamping Boutique (TSB) I was featured!!! Now I know when you hear the word Emo you think dark colours but I wanted to lighten it up! I used lighter copic colours paired with paper from Bo Bunny and added some flowers by Mulberry Street and some pearls. Cute right? To sign up for the newsletter you need to go HERE!! Don't miss out on the next one. You can hear about all the upcoming TSB events, learn new tips/tricks and don't forget your free image in every issue!! Shopping Our Stash Blog Kick-off Reminder!! Enter for your chance to WIN!! 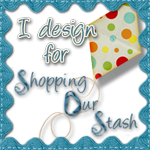 Just in case you forgot I'm here to remind you that Shopping our Stash (SOS) Challenge Blog's Open House Kick-off is on for one more week only so there is still plenty of time to show us your stash!! If you share with us by posting a photo of your scrap space over at the SOS blog you are entering for your chance to win some gorgeous seam binding ribbon from Prairie Bird Boutique! If you win you will get to select which bundle you would like from her assortment and get three colours of 5 yards each. We hope you will play along with us!! 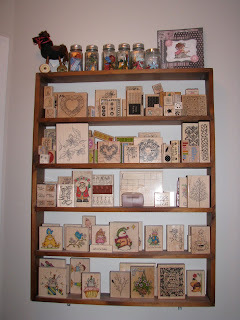 Be sure to check out some of the amazing photos of the scrap spaces posted!! This week's Critter Sketch Challenge #65 has a theme and it is HIP TO BE SQUARE!! That's right you need to use a square somewhere on your creation! Easy-peasy, right? For my card I used another image by our fabulous monthly sponsor Wags n' Whiskers called Speed Racer! I thought this card would be perfect for one of my nephews birthdays! I used Bazill Cardstock and the glittery background paper is from the Grade School Paper Stack from DCWV. The image was coloured with copics and as well as cutting out the image and card in square shapes I also had some square brads that I've had forever and thought they would be perfect so I added them too!! Now since our challenge this week is super easy we'd love you to play along!! It's time to celebrate!! It's Paper Sundaes Challenge #69 and we are having a birthday celebration!! Not our birthday but one of our DT founding members Christine just celebrated a birthday and we decided Birthday Celebrations would be the theme this week! HAPPY BELATED BIRTHDAY CHRISTINE!! 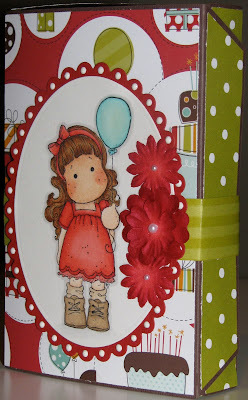 Our fabulous monthly sponsor Simon Says Stamp is sponsoring the challenge this week and I used a Magnolia Image called Balloon Tilda which I coloured with copics. Now I decided to make my first ever box instead of a card this week and I'll definitely do it again. 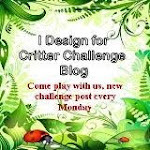 I used DP by imaginisce and Stampin UP. I cut the image out with nesties and added some white liquid applique to add some texture around the scallop oval. I also added glossy accents to the balloon. The above picture shows the box from the side. To open you slide off the band which has the image attached and the box opens. NOW....I would love to tell you what is in the box however it is a SURPRISE!! I will be mailing out to our DT member Christine for her birthday. Shana, another founding member of Paper Sundaes is having a contest in honour of Christine's birthday. It is only open to 40 participants and in order to enter you need to create a birthday card and send it to Christine. The prize will be a $20 gift certificate to a store of the winner's choice - which will be doubled to $40 if you post about the contest on your sidebar!! The winner of Shana's contest will be drawn once all cards have been received by Christine. This will coincide with our Paper Sundaes Challenge so you can enter in both! How perfect is that? A chance to win two separate contests with basically the same challenge!! I sure hope you will play along with us! Be sure to check out their blogs, their work is AMAZING!! 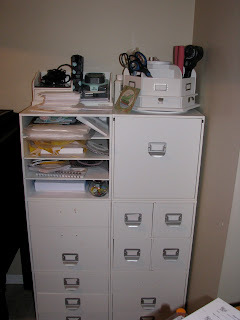 All the white storage cubicles I got at Michaels when they were on sale. I love them for the most part however the handles keep coming off so I think I'll be crazy gluing them or something. I still haven't labelled each drawer (which is easy I know) and should do soon since I spend half my time trying to remember what drawer holds what items! My space (AKA my kitchen table) and is usually covered so we rarely eat here. Sad I know!! Usually it is messier however it wasn't too bad when I took the photo. 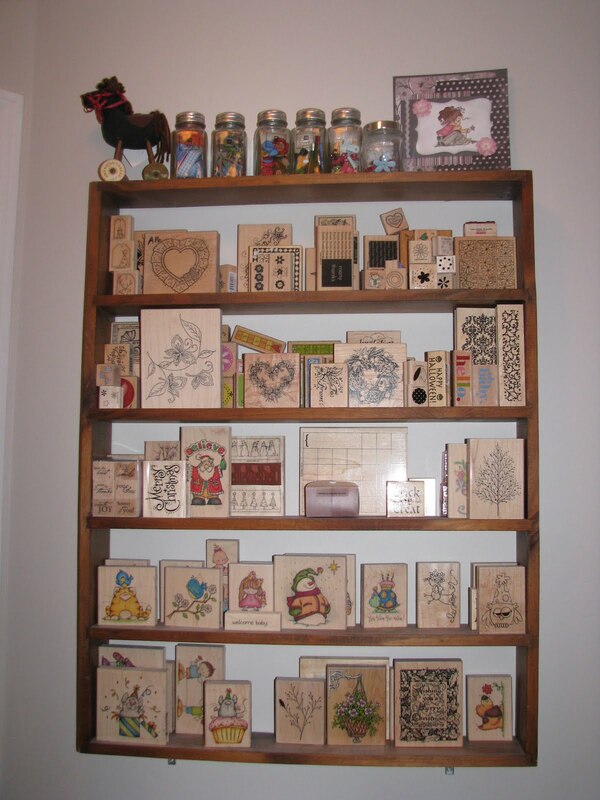 All my mounted stamps below and all my unmounted I have in the Stampendous storage containers (love them) and they are stacked somewhere in my cubicles. 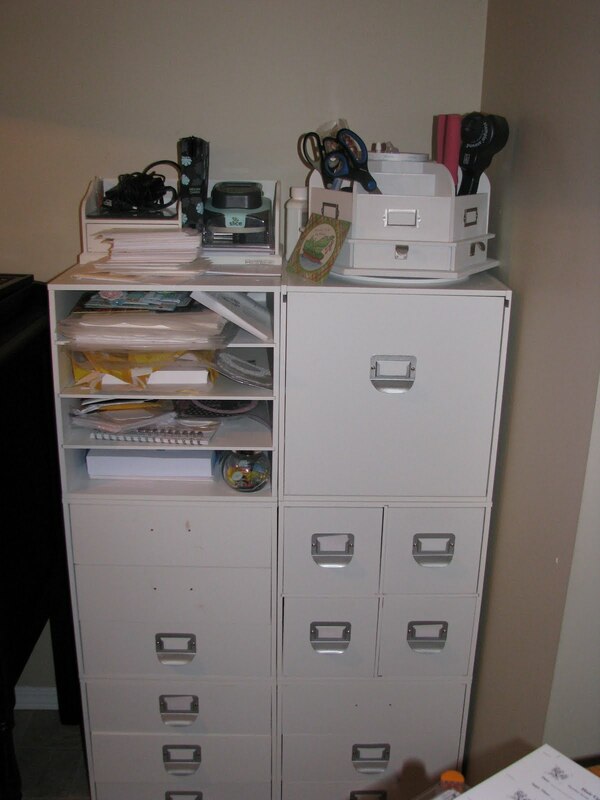 The drawers make it look like I am organized however this is so not the case!! I haven't shown you all of them but here are two of my ribbon drawers. and my distress inks which I have rarely used but hope to use more soon!! So there you have it some photos of my scrap space & my stash of supplies. Many of which I will be using more of once the SOS Challenge Blog kicks off! Be sure to check out the SOS blog to meet all the SOS DT girls and see photos of their scrap space! 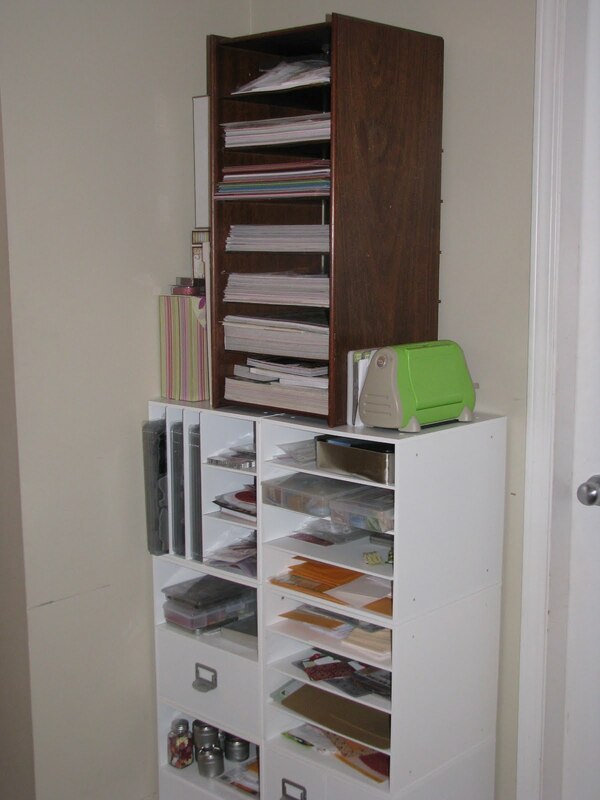 There are some really great ideas for storing nesties and ribbon that I saw so you may get some new ideas for your own space too! I can't wait to see the photos everyone posts and get some other ideas for storage! The Kick-off will run from May 10th to May 23rd so be sure to link to our blog for your chance to win your choice of crinkled seam binding ribbon bundle from Prairie Bird Boutique! All entries will also be entered into a draw for our May prize as well. Have you seen the Enchantment Line of Digi images over at The Stamping Boutique? There is such a wonderful selection of images in this collection and I used "She who Paints the Forest" for my card. I coloured her with copics and then used some stickles and shimmerz to add some glitter to her wings, dress and the pretty flower she is painting! I added some glossy accents to all the little red berries and parts of the flower and added some flowers by Mulberry street and some clip by Making Memories to hold it all together. I think the paper was Bo Bunny but it was from some leftover scraps I had so it wasn't marked. Did you know that The Stamping Boutique has some exciting news to share?? On Tuesday May 10th The Stamping Boutique is having Digi Dollar Day!! This means that all digi images in the What's New Section of the store are only $1.00. Perfect time to stock up and such a great deal. There are many wonderful images listed there including 3 images I've used recently!! Be sure to stop by and take advantage of such a great offer. I used the fabulous sketch provided by the Sweet Sketch Wednesday Blog and it is their 100th sketch and they had a fabulous blog hop to celebrate. I entered my card in their challenge this week. I used all scraps from my scrap file and I knew right away when I chose the image the paper I wanted to use because it had lots of glitter. 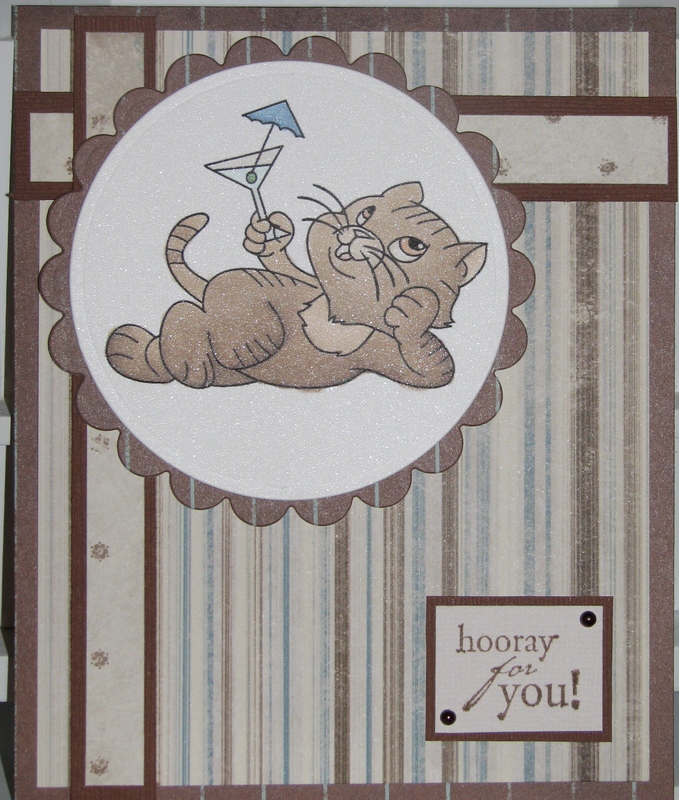 I also used Bazill cardstock and embossed with my Swiss Dots Cuttlebug folder. 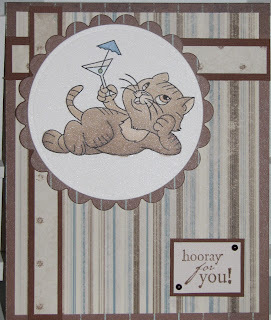 I used nesties to cut out the image which was coloured with copics and also cut out some flourishes with a Sizzix die. I added the pearls to complete. I will definitely be using this sketch again it was a lot of fun to work with! Be sure to check out Paper Sundaes for the rest of the Sundae Girls creations and play along for your chance to win some fabulous images from Pink Cat Studio! It's time for Critter Sketch Challenge #63 and this week it's a sketch drawn by our very own Melanie!! I love this sketch it was super easy to use and just perfect for this image I used called "Sip 'n Sun" by this month's sponsor Wags 'n Whiskers. 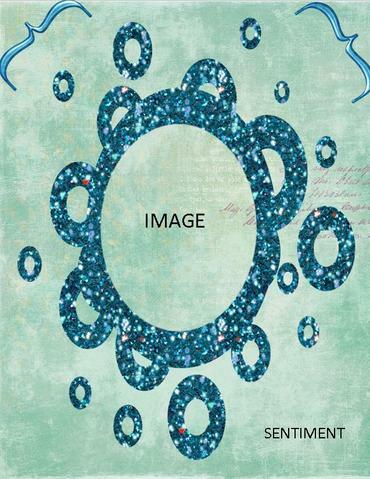 These fabulous images are available in the US & Canada from Stamp & Create! I was able to use up scraps from my scrap pile which was great so I'm not sure of the manufacturer. The sentiment is from an old called "From the Heart Greetings" by Hero Arts. The image was coloured with copics and I added a few pearls as well. I hope you play along with us this week!! I used an image from Sugar Nellie's Simply Sassy Line called "Luv you a Latte" that my friend Sandy brought back for me from Scotland when he last visited. I think she is so cute! 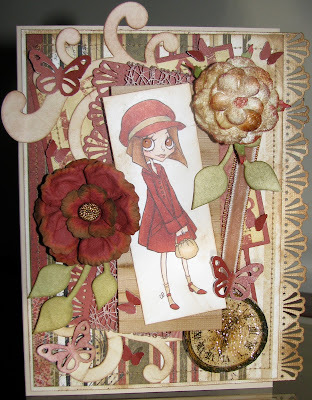 I paired her with paper from Bo Bunny Gabrielle paper pack and added a sentiment from an older CC Designs Kit. The fabulous sketch is from The Sugar Bowl Challenge #58 Marlena's Sketch with an option to include buttons. I love Sugar Nellie images so I'm super happy to be playing along this week! 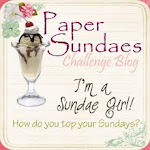 Paper Sundaes is also having a DT call and you can read all the details here!